In December 1850 William Harris senior, now aged 54, although living in Lambeth was working as a stonemason in Central London. 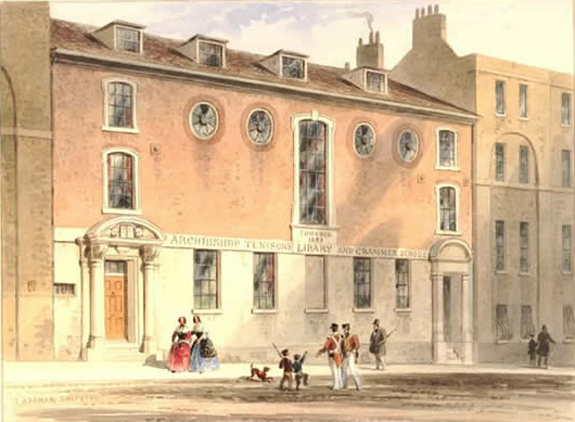 Records of the St Martin in the Fields Workhouse in Castle St near Trafalgar Square show when William first visited for overnight accommadation in December and was a frequent visitor over the next few months. The admission and discharge registers detail William's story at this time. when he absconded after dinner. We assume he prefered to spend the rest of Christmas with his family. after breakfast. (B in the last meal before discharge column). 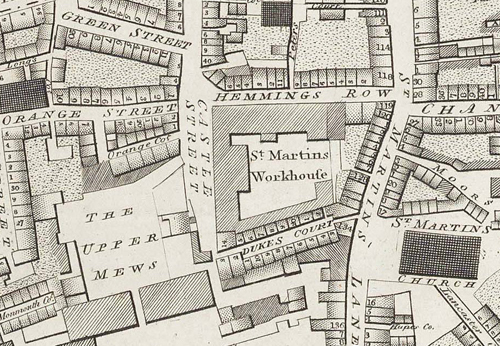 An early map from 1799 showing the workhouse and immediate area. yard. The discharge shows them leaving after breakfast the following Monday. William Harris returned the following day, Tuesday 7th Jan. He is claiming relief for want of employment. his own family, namely his wife Sophia and their 2 children James (aged 4) and Sophia (aged 2). Four year old James was discharged to the care of his grand parents on Sunday 19th January. Sophia stayed with her mother. Library and Grammar School which formed the centre section fronting Castle Street. He was discharged (see below) at his own request on Wednesday 26th February. View of workhouse from Hemmings Row. for want of employment on Monday 17th March 1851. 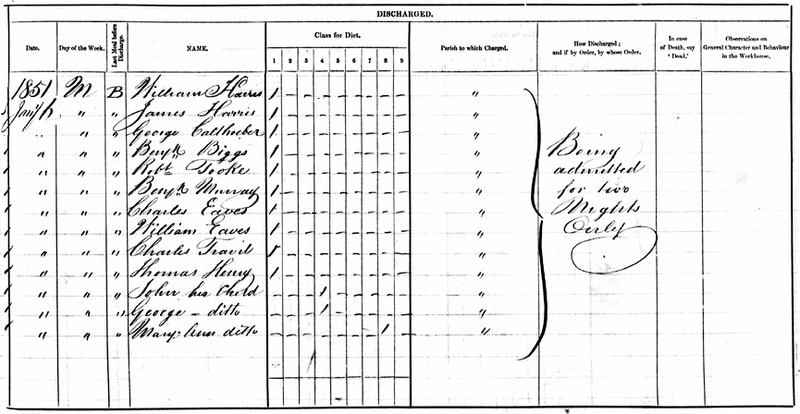 At the time of the Census on 30th March 1851 the Harris family were living at various locations. William and his wife Elizabethwere living at Upper Marsh Lambeth. 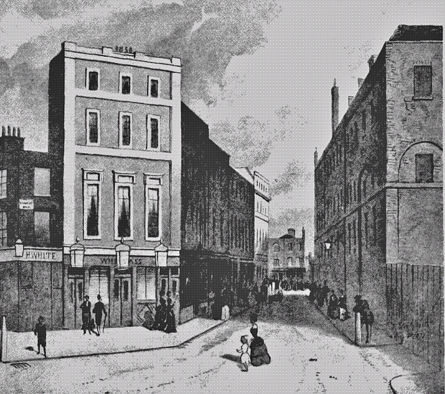 His son James Banfield Moore Harris was at this time at the Workhouse at St Martins in The Fields London. 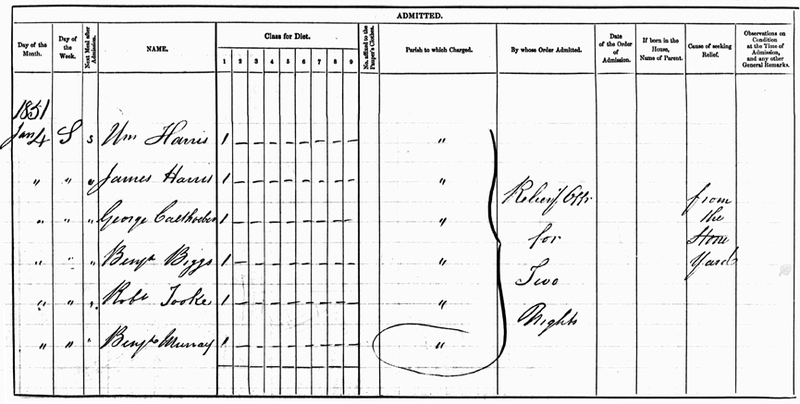 The census extracts below show James (bottom) aged 30, his wife Sophia aged 26, and above her their daughter Elizabeth (Betsy) aged 2. Their only other child was James who was now aged 4 and living with his grandmother in Southwark. 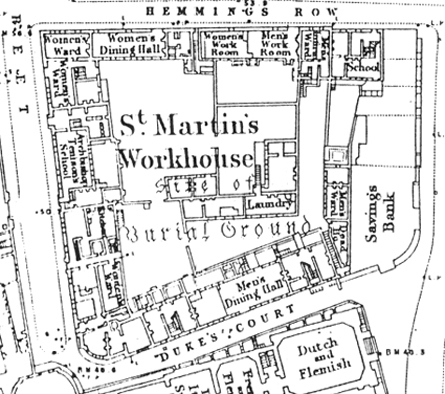 View of workhouse from Dukes Court.